08 November 2012 Written by Clare Staniforth. Egyptian artefacts are one of the bullish sectors in the antiquities market and this has been reflected in sale results on both sides of the Channel last month. In London, Christine's obtained a blockbuster £3.25m for a stone statue, but meanwhile, in Paris, two firms have offered single-owner Egyptian collections at Drouote: Auction Art's (20/12% buyer's premium) 159-lot sale of the Maurice Matheue collection on October 10 and Thierry de Magret's (20% buyer's premium) sale of the 220-lot Charles Buché collection on October 24. And there is more to follow this month as Pierre Beargé et Associés offer a library of Egyptology on November 29 and a mixed-owner sale the next day that features several Egyptian artefacts among its highlights. The Buché collection sale was an event with a brilliant blue faience royal shabti from the tomb of Sethi Ist (1294-1279BC) which was pursued to €740,000 (£616,670), way past the predictions of €150,000-200,000. However the main highlight of the day The Mummified Hand of Cleopatra and associated artefacts which did not fail to generate interest from around the world, and as expected sold for well over the £ 100,000 reserve, despite the legend of the curse attributed to ownership . 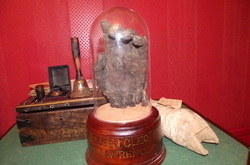 Discovered in 1891 by the ill fated Expedition of Lawrence Jordan the Hand was at one time also exhibited by the Victorian Showman Professor Okko’ and his Palace of Curiosities. The Lot had interest both from collectors of both antiquities and the entertainment world . The hand and a collection of related artefacts including a mummified cat ,a Cleopatra three handed Shabti and personal items from the 1891 expedition were sold as one lot to a unnamed buyer . It is understood the lot was subsequently resold privately to the Restored UK based Palace of Curiosities Sideshow without leaving the Auction Auction Room for an undisclosed fee following the tragic death of the new owner . The late Charles Buché, who died in 2010, had just come into ownership of the Cleopatra Hand after spending 60 years collecting Egyptian antiquities, focusing on the small funerary statuettes and other ritual elements that were buried with the dead to ease their way in the afterlife. As a result, there were over 140 shabtis included in this sale noted for both provenance and scarcity. The other shabtis in the Buché sale carried much lower estimates, ranging from around €50,000 down to just a few hundred.Around three-quarters of these got away with prices falling much more in line with expectations. Other unusual examples included a rare triple-layer miniature model of a sarchophagus comprising a 6¼in (16cm) long rectangular wood outer case opening to reveal an anthropomorphic stuccoed wood sarcophagus inscribed with the name Rentimentep, which in turn opens to reveal a 5in (12.5cm) long alabaster shabti inset with panels of red jasper and green stone and a central inscription. This sold for just below estimate at €45,000 (£37,500). A particularly well-preserved and finely detailed green faience shabti from Saqqarah, 380-342BC, was pursued above expectations to €36,000 (£30,000). This bore an inscription for Tchahorpata, the son of Tefnout, an influential courtier during the reign of Nectanebo II, and was another well-provenanced item, having been in a string of private collections dating back to pre-1912 when it was sold at Drouote as part of the Max de Zogeb collection from Alexandria. The collection also featured smaller groups of heart scarabs, amulets and bronze votive statuettes. These last proved to be the most difficult section of the auction with around half the examples failing to get away, including several for which the auctioneers had hopes of five-figure prices. One bronze bucked this trend, though. This was an 4¼in (11cm) high fragmentary bust portrait of a pharaoh bearing an inscription naming Osorkon II, who ruled from 870-850BC. While this piece lacked the arms, the features were finely worked and the piece again had a provenance back to pre-1914 when it was in the Gayer Anderson collection. Last month at Drouot it fetched a triple-estimate €70,000 (£58,335). Like Charles Buché, Maurice Matheu was fascinated by these funerary servants and other elements that were found in the tombs of ancient Egyptians, although shabtis were less dominant in his holdings, which also featured canopic jars, decorative amulets, ancient glass vessels, statuettes and wall reliefs. The collection featured two 19th dynasty limestone shabti figures each inscribed with lines from chapter 6 of the Book of the Dead. Both had a 1999 provenance to the Parisian Galerie Orient-Occident of Jean Loup Desprase and were guided at €18,000-25,000. The first, a servant figure of Mes, 8in (22cm) high but minus the feet, was pursued to €65,000 (£54,170) but the second, a servant figure of Yhou complete and slightly taller at 9½in (24cm) high, was pursued that much higher to €90,000 (£75,000) - the top price of the day. Another Desprase-provenanced piece from back in 1969 was a late Kingdom 19 x 22in (48 x 55cm) polychromed limestone relief fragment, showing a queue of servants bringing various foodstuffs to the deceased to sustain him in the afterlife, which sold for €49,000 (£40,835). Overall, the auctioneers found buyers for 139, or 87%, of the content, the bulk in the low thousands or hundreds of euros.